Tucked into the lower floor on a side street of one of the more dynamic neighborhoods in Yoyogi Village is Tarui Bakery , a uniquely charming bakery that is currently crafting some of the best bread in Tokyo. 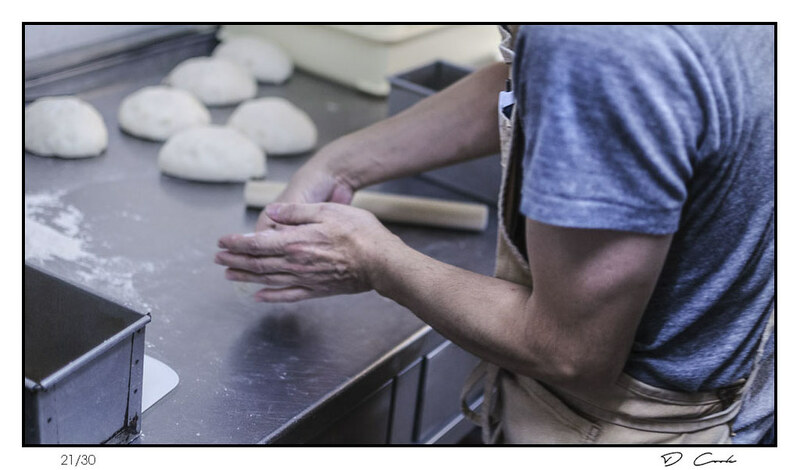 Its proprietor is Hayato Tarui and each morning he rises to pursue a vision of what modern breads ought to be – delivering clean flavors with complex textures in elegantly rendered forms. While the breads may seem simple in appearance, the building wave of complexity that unfolds with each successive bite leaves no doubt as to the impeccable craftsmanship that lies behind each loaf. 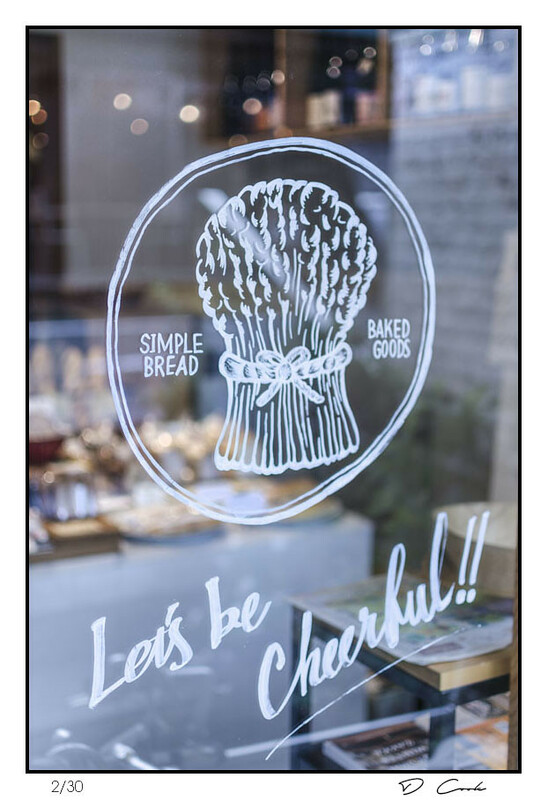 A black and white signature logo visible at the entrance of the bakery – designed by Papier Labo – symbolizes this dichotomy perfectly. Hayato’s interest in French food first took root in elementary school, when his parents took the family for a Western food meal. The experience would leave a strong impression on his young mind and eventually sparked him to enroll in Tsuji Culinary Institute – perhaps the finest culinary school in the world. Upon graduation he began his journeyman years at a classical French restaurant in Tokyo. With each passing year his interest and understanding of the intricacies of taking ingredients and elevating them into something better grew. The appearance of classical French cooking often belies the many hours of preparation that render basic ingredients into something much more profound. Today Hayato applies those lessons to baking as the Tarui egg sandwich perfectly illustrates. A simple round bun with “egg salad” inside seems to be straightforward and one expects the ordinary. Biting into it reveals an addictively soft bun framed by a thin, chewy crust that has been kissed lightly with sweetness on its surface. This gives way to a rich eggy interior that is texturally both creamy and chunky. Taste buds oscillate from the push and pull of the savory egg, sour minced cornichon pickles and sweet bread crust. The result is an elevation of the basic egg sandwich into something much better and admittedly highly addictive. 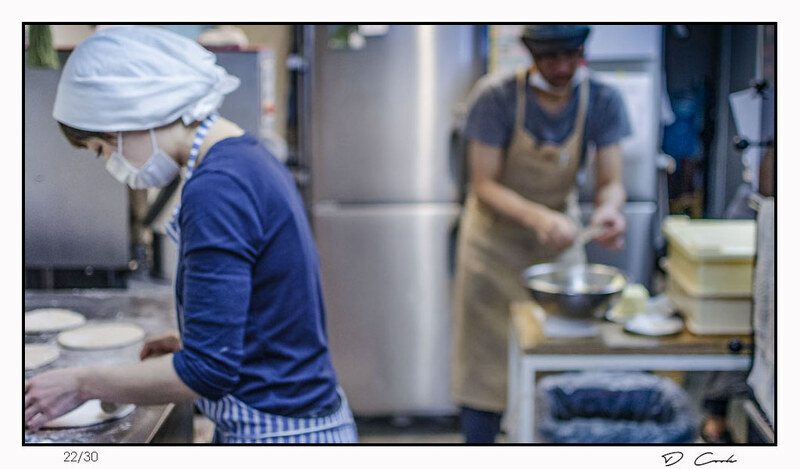 Next stop for Hayato was learning the basics of baking at classical French bakery Levain, also located in Tokyo. Levain specializes in long fermentation breads that are baked in a stone-base oven which give the breads a rustic, traditional feel. A recent trip to Levain revealed a bakery seemingly lifted from an early 20th century French village. The interior is anchored by a massive brick oven around which staff sift, mix and shape a small variety of breads throughout the day. 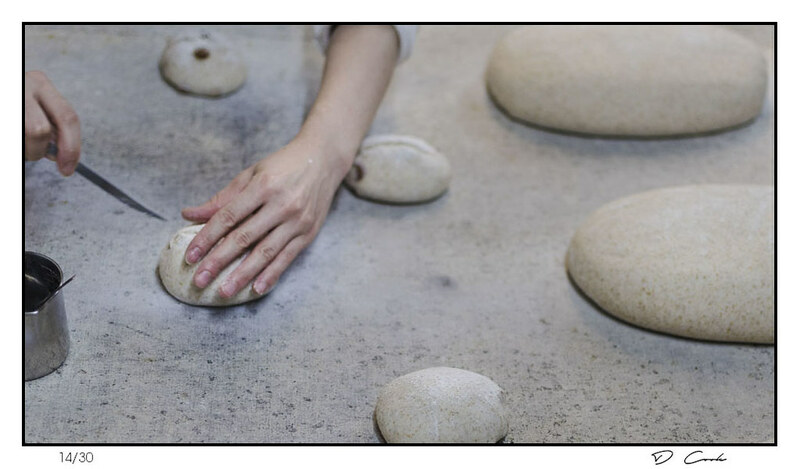 It was there Hayato learned to mix breads with a just a few simple ingredients – premium stone ground grains, water, salt and a wild yeast starter. After eight years of elevating his skills and deepening his knowledge Hayato reached the point where he was itching to take the final step on his journey and open his own shop. 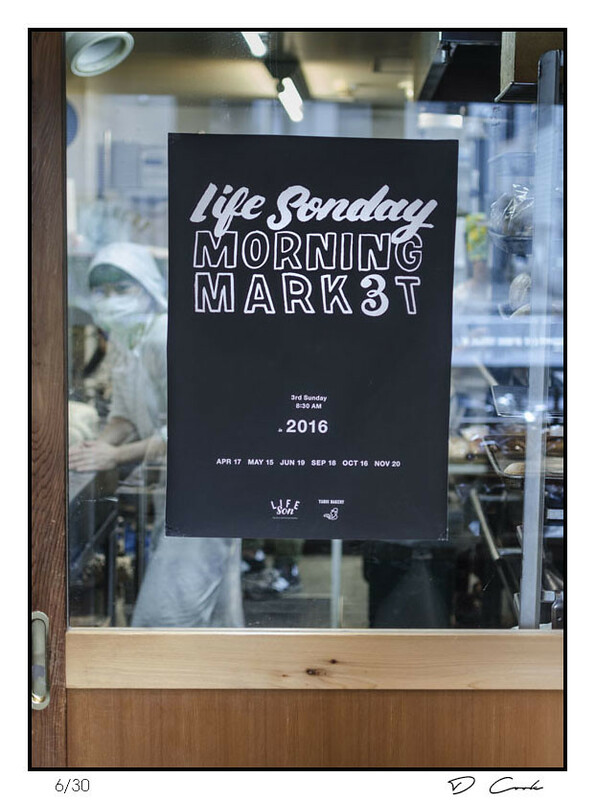 It was around that time that Shoichiro Aiba of Life restaurant invited him to open a bakery next door to his own latest project – Life Son. With that nudge of encouragement Tarui Bakery was born. 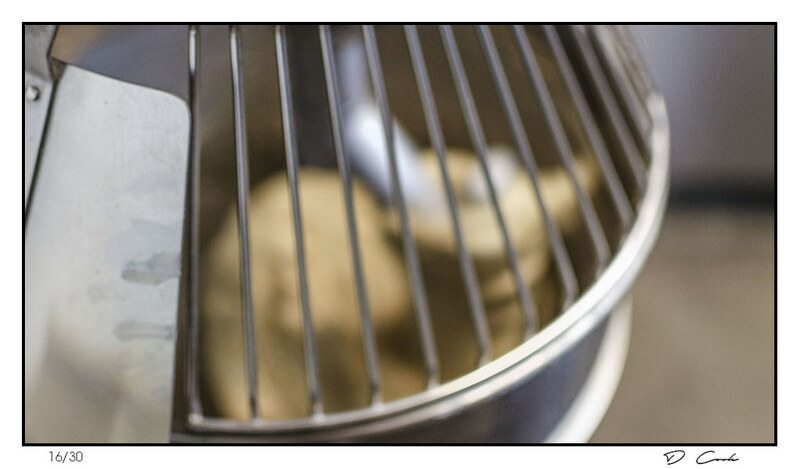 To use a wild yeast starter in a bakery is a decision not to be taken lightly. Once alive, wild yeast culture is best described as moody – that is to say it is easily affected by the humidity and temperature changes that occur on a day to day basis. A wild yeast starter – often called a ‘chef’ – needs to be fed regularly in order to keep both its leavening ability peaked and its acids in balance. It is historically associated with the French pain au levain or English sourdough. 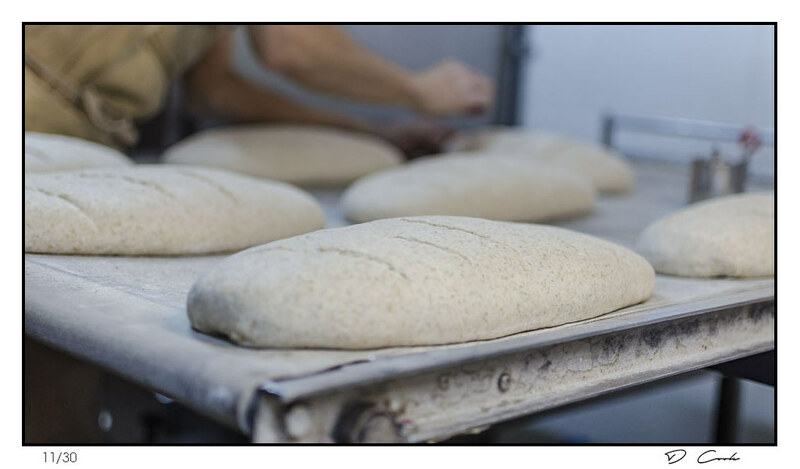 Properly crafted and proofed sourdough is compellingly complex in both flavor and texture. It carries many advantages over other bread methods including being easier to digest, self preservation (the acid present discourages mold) and pairing well with other foods and beverages. To be clear, it is a far cry from what passes in many supermarket bakeries as sourdough which are overly sour and simplistic simulations of the real thing. 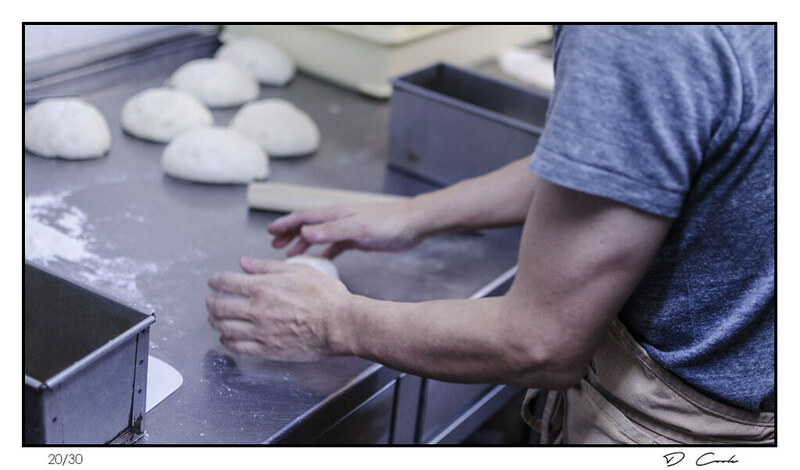 Crafting real sourdough bread takes skill, patience and perseverance to achieve consistently good results. The reason most bakeries prefer to use commercial yeast comprised of just a single strand is that it arrives in maintenance-free blocks and delivers fast, predictable rises that reduces the proofing time of loaves. These savings in time and money come at the expense of the quality and uniqueness of the bread. At Tarui a housemade yeast is cultivated from Beau Paysag grapes that come from the fruit-growing region of Yamanashi (near Mount Fuji) and is used in almost all of their breads. It takes considerably more time and effort to maintain this yeast culture and yet Hayato feels the unique flavor it imparts to the breads of Tarui Bakery makes it worthwhile. This is a choice only an artisan would make. The first time one bites into Tarui bread the difference is clear. Pain de campagne (country bread) is a bread that was traditionally made in the 19th and early 20th centuries in France but has been replaced in popularity by white bread in both Europe and North America. In Japan most people have grown up eating soft white bread and amusingly call breads with crunchier, thicker crusts “katai” (hard!). Levain Bread is a customer favorite. 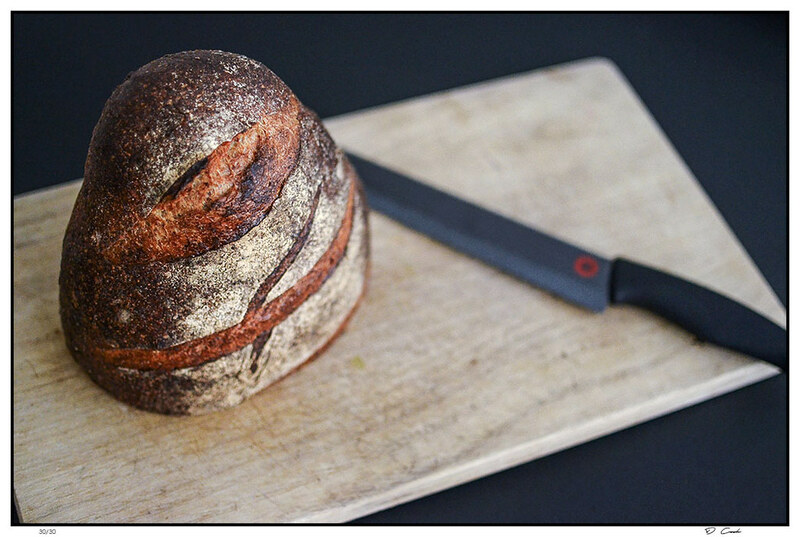 For the purist the pain de campagne is the choice to make – there is just so much to like about it. Its richness in character charms at the first meeting and endears at an escalating pace thereafter. These are the largest loaves baked here and are given lengthy rise in wicker baskets lined with linen. 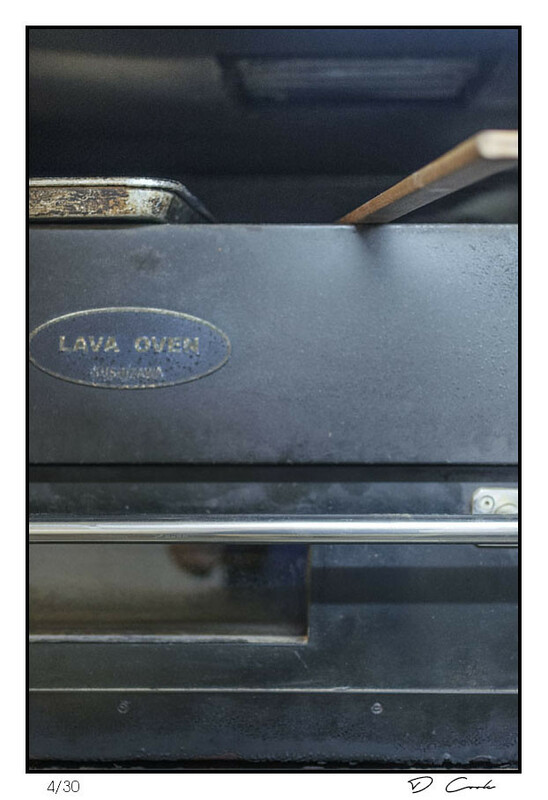 Usually baked around noon they exit the oven enrobed in a dark mahogany crust dusted with white speckles of flour. Once cooled and cut their creamy interior releases an enticing swirl of aromas into the room. Toasted wheat and rye intermingled with subtle fruit notes, contributed by the wild yeasts present. Offspring of the pain de compagne include dried fruit and nut breads. The beauty of these breads is they match up incredibly well with roasted and braised dishes, the acid contributed by the wild yeast acting as a liaison between food and wine or beer. Baguettes glow dressed in elegant golden crusts with beautifully opened slashes stretching rhythmically in a diagonal pattern down the length of each loaf. The crust and interior are strikingly different – one crisp and chewy, the other soft, creamy and airy. Reminiscent of a catchy pop song lyric that hooks you in, it is the tiny details in the textures and flavors that has you coming back for more. 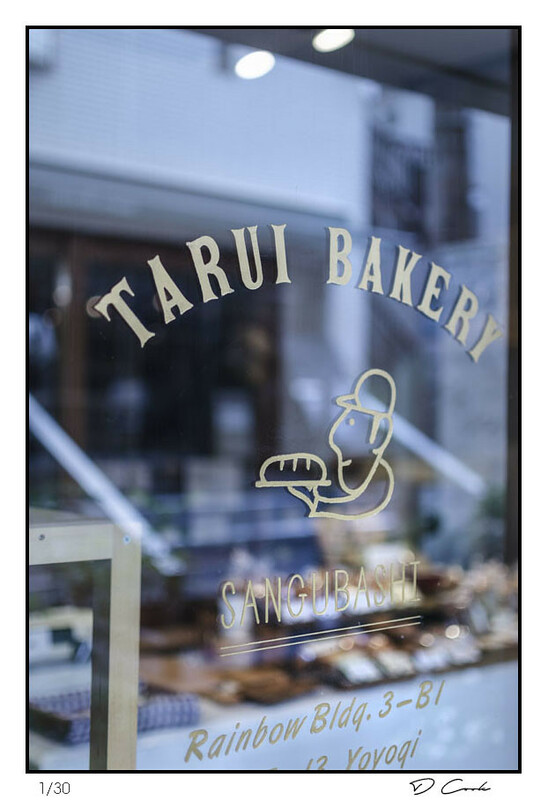 Tarui Bakery also offers a series of soft Japanese sweet breads and savory white breads. Combinations always make sense with filling to dough ratios carefully adhered to that tend to accentuate each ingredient while maintaining a wonderful overall balance. Soft milk bread mini breads stuffed with red bean paste are a reflection of culture and place. The Milk Cream Sandwich is presented in a long bun filled with a mixture of smooth butter and creamy condensed milk and delivers a dreamy experience akin to Choux pastry (cream puffs). Its flavor variations include plain, raisin and chestnut depending on the season. At its core a bakery is a place to buy food to nourish the body. Most neighborhoods have a bakery like that. Sometimes a bakery will have a cultural theme like Portugese, French or Danish providing customers with offerings that satisfy nostalgic longings. On a rare occasion a bakery giving even more. The final element that elevates this bakery above most is the each product tells a story. As always the story begins with the ingredients chosen. One particular visit to Tarui Bakery demonstrates this point well. It was early August, when the heat and humidity in Tokyo are peaking and one ventures outside during the middle of the day only if one must. It is a short walk to the bakery from our design office but long enough to feel the summer heat. As I stepped inside the bakery my attention was captured by the heady aroma of rosemary wafting through the air. Curious, I inquired what flavor the golden and dimpled focaccia cooling on top of the cutting board was. Rosemary and golden corn grown on a farm just north of Tokyo and hand-picked at 4:00 a.m. that morning! 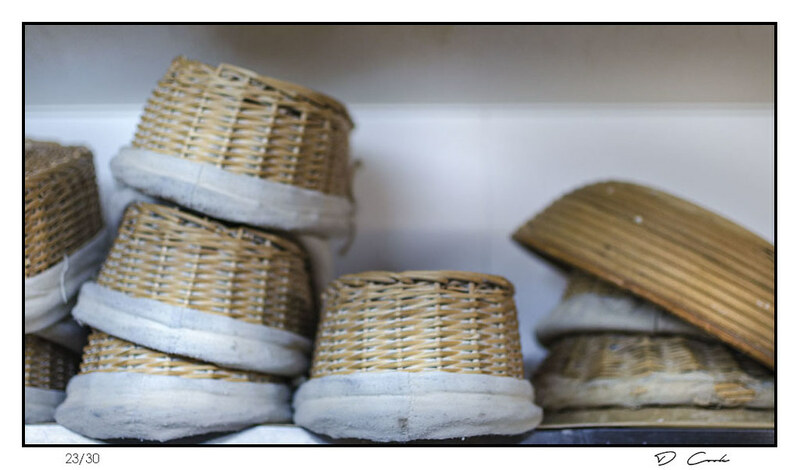 That says everything about the both commitment to sourcing quality and how in synch the baking at Tarui is with time of season and geographic place. The food here communicates a sense of time and place and the community is better off for it. Freshly baked Pita bread is a barometer for the seasonal changing of vegetables. At its core is a delicious hummus spread inside before local farm vegetable are added. Various combinations have included asparagus spears with tomato and other times roasted vegetables like eggplant, maitake mushroom and zucchini. Various baguette sandwiches are always available and include ham with Kochschinken ham from Kagoshima combined with soft, creamy brie. A rarer combination yet is a semi hard wash-rind cheese from a Nagano farm located 2500 meters above sea level. One final gem that regulars will have noticed is the small clear containers of salads that appear on Friday and Saturday at the bakery. Made by a friend named Funa they are a fascinating mix of fresh herbs, vegetables, spices and sometimes fruit. Each offers its own juxtaposition of fine textures and flavors the push and pull the palate in different directions. That they are as healthy as they are delicious is a point easily forgotten – and something that could also be said about Tarui Bakery as well. 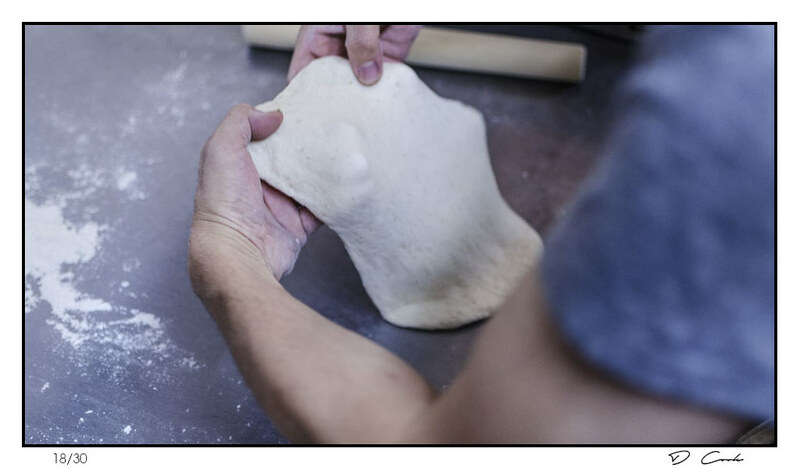 Levain style breads require a much longer preparation time and greater commitment to maintain. For this reason even on holidays the health of the levain starter must be accounted for. 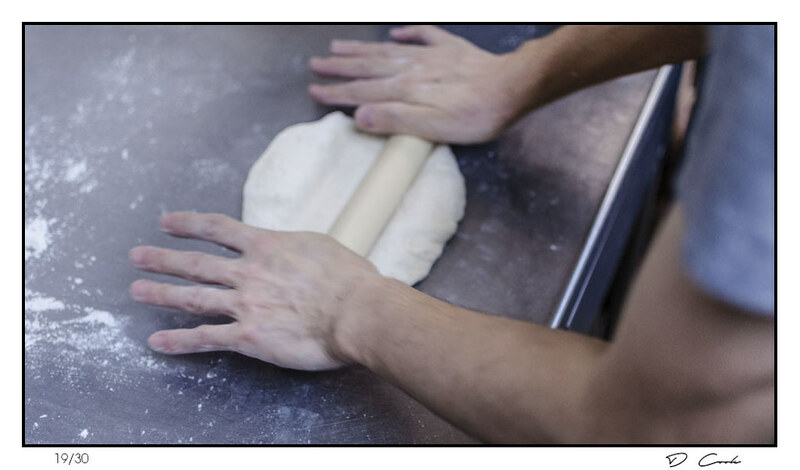 The life of an artisan baker is such that the line between work and private life eventually blurs. Those that appreciate the individual uniqueness of wild yeast leavened breads hold a special place in their heart for this type of baker. That these breads deliver a full throttle of nutrition can be put down to the choice of stone ground flours from Hokkaido. 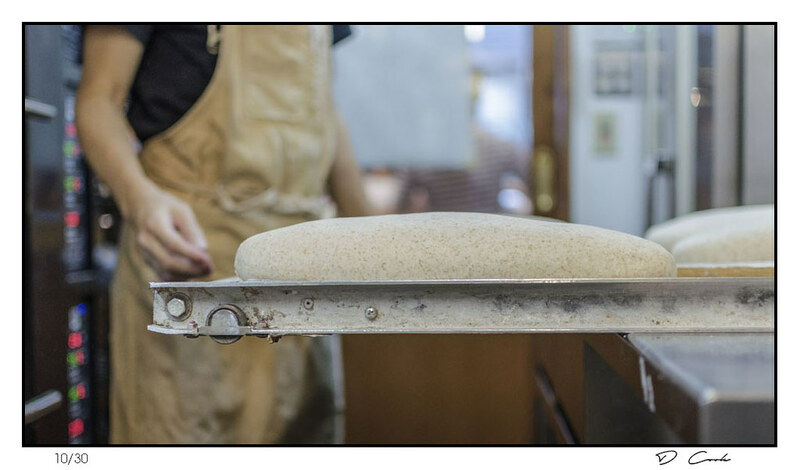 Unbleached and stone-milled flours mostly from Hokkaido wheat are found across the entire range of breads at Tarui Bakery. 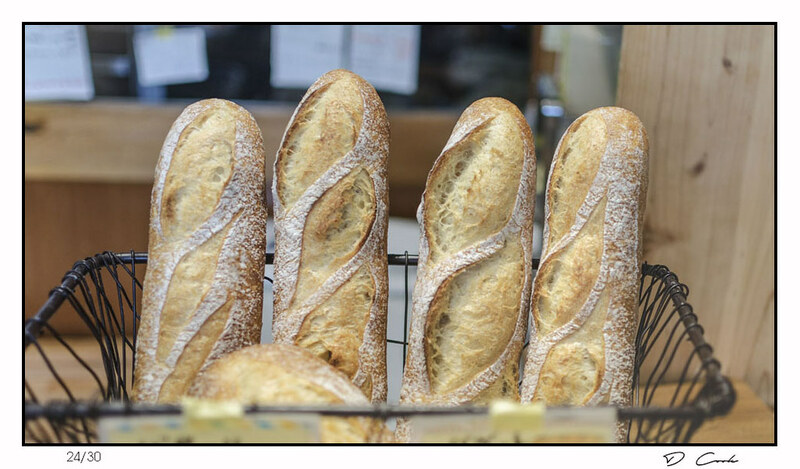 They come in a variety of shapes an forms like baguette, boule, batard or pullman loaf. On weekends egg sandwich, sausage, croque monsieur and pita stuffed with hummus + seasonal farm vegetables. 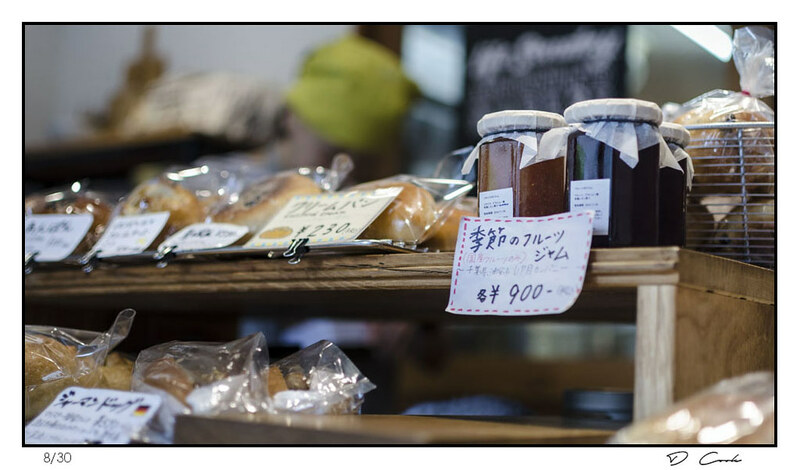 Various craft made goods like cutting boards and natural cotton shopping bags annointed with the Tarui logo are also available along with a small collection of preserves from Japan and savory ingredients from abroad. The Yoyogi area has a high proportion of residents who work in fashion, entertainment, publishing and other creative industries. It offers a good balance between nature and city life due to its location near Yoyogi park somewhat akin to Central Park in New York. 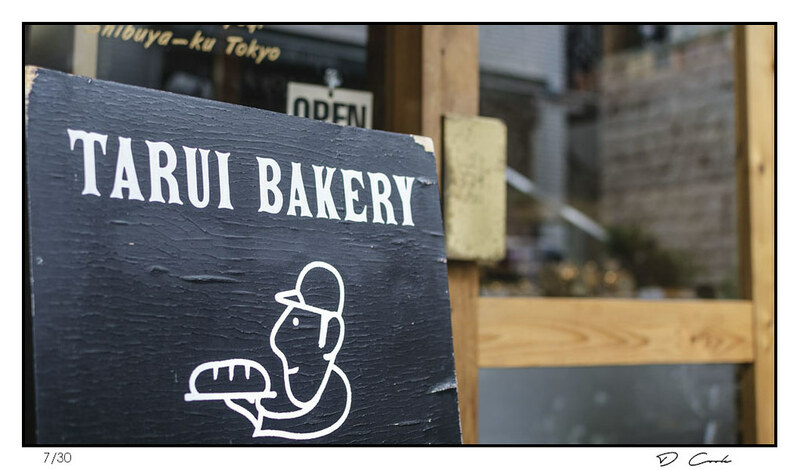 The owner of a sandwich shop near Kamiyama street – frequented by local celebrities and foreign tourists alike – rides his bike daily to pick up Tarui Bakery bread. 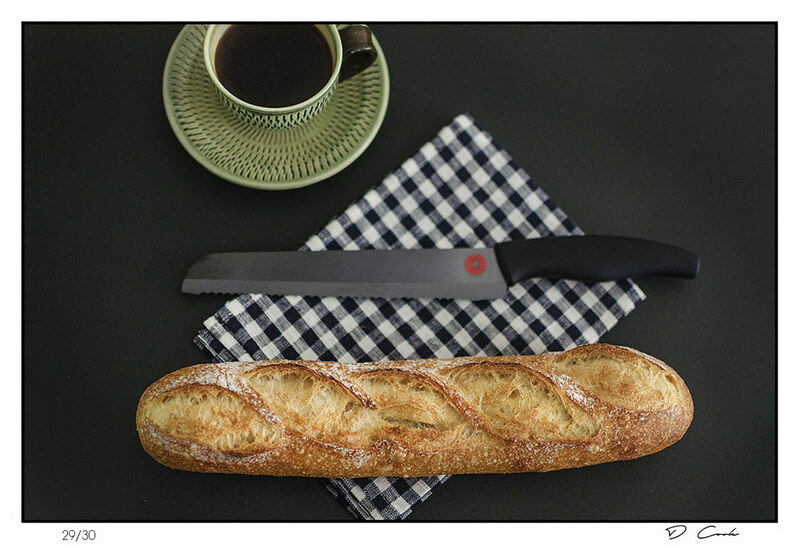 The rich and rustic Pain de Compagne is delivered for lunch and dinner service to a French bistro one kilometer away. Of course Life Son restaurant next door that serves the full gamut of Tarui bread to compliment perfectly its own vision of food service. The in between hours of Life Son restaurant – morning and late afternoon – provide an opportunity for customers to pair Tarui Bakery goods with LifeSon coffee and enjoy them on the front terrace under a canopy. This is a good way to introduce yourself to the breads of Tarui and makes for an enjoyable side trip before a day trip to Yoyogi Park. For regulars there are special events that take place throughout the month. One such event is the organic vegetable market which gives the opportunity to purchase “raw” some of the ingredients often found in the bakery’s goods. Another is the once a month wine bar taking place on a Sunday after 5:00. On offer are a mix of natural wines and appetizers that dazzle the palate and the intrigue the mind – all handpicked by Hayato. 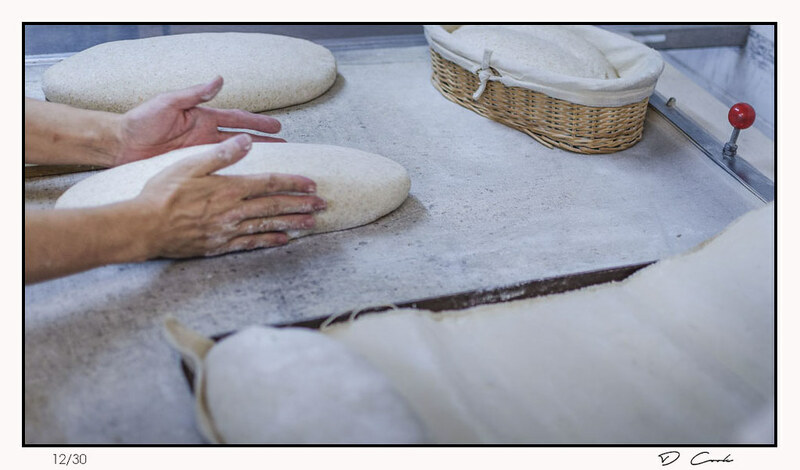 Taken together Tarui is more than a fine bakery for it offers a vision of how bread that is made from wheat grown and milled properly, can be transformed with skilled hands into food that feeds the body, satisfies the palate and enriches life.